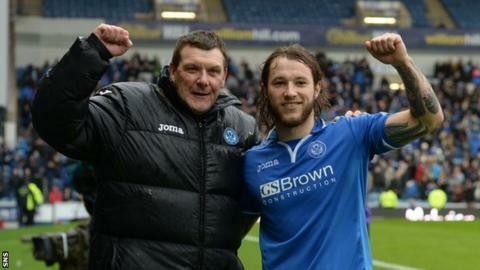 Tommy Wright hailed his "magnificent" St Johnstone side after they came from behind to beat Aberdeen and reach the Scottish Cup final. Stevie May scored twice to send Saints into their first Scottish Cup final in the club's 130-year history, cancelling out Niall McGinn's opener. "We went a goal down but the good thing was we responded well," Wright told BBC Radio Scotland's Sportsound. "There's 130 years of hurt released today. I'm absolutely delighted." St Johnstone trailed at the break but were rewarded for an impressive second half display to book their place in the final against Dundee United on 17 May. "I'm absolutely delighted for the club," said Wright. "The chairman [Steve Brown] is here with his dad [former chairman Geoff] today and I'm delighted for the supporters and, more importantly, I'm delighted for the players. "Listen, I got one thing wrong. I had a dream when I was in hospital that we'd win it 2-1. But I got it wrong, because Michael O'Halloran scored the winner. "Getting to the final for the first time means a lot to the club and the supporters. They have had so many semi-final disappointments. "Even within the squad there a guys like Dave Mackay, Steven Anderson and Chrisy Millar have endured losing in semi-finals. "It is something we have never achieved before but there is a belief about the place that maybe this year could be our year. "On any given day we can beat anybody and we are looking forward to the big day."